If you want to ‘up’ your poker game, there are many places to gain inspiration. Throughout history and up to the present day, there are many expert poker players, who’ve elevated the game almost to an art form. Here are some of the biggest names in poker, and some interesting facts about their lives and gambling careers. David Edward ‘Chip’ Reese was born March 28th, 1951, in Centerville, Ohio, and his experience in gambling made him the youngest player ever introduced into the Poker Hall of Fame by 1991, becoming their nineteenth member. His passion for poker began during a childhood bout of rheumatic fever when his mother began to teach him card games. Something of a poker prodigy, he was trouncing his much-older schoolmates at poker by the tender age of 6. ‘Chip’ Reese was introduced to high-stakes poker shortly after receiving his undergraduate degree from Dartmouth College. His intentions were to pursue a graduate law degree at the prestigious Stanford University. However, a visit to Las Vegas in the early 70s made him eager to stay there, which meant that he never made it to university. In just a couple of months, Chip has built his bankroll up to $100.000, and he never looked back. He was also firm friends with many of the other top poker players, including Jonny Moss. In a weekend-long game with Moss and Doyle Brunson, Chip actually managed to increase his bankroll to an impressive $400,000. Going from a job selling his friend’s father’s land to a Poker Room Manager’s position allowed him to prevent cheating and could produce a safe environment for both the casino as well as the players. As a result, he was able to hone his poker skills without the worry or fear of being conned by other players. 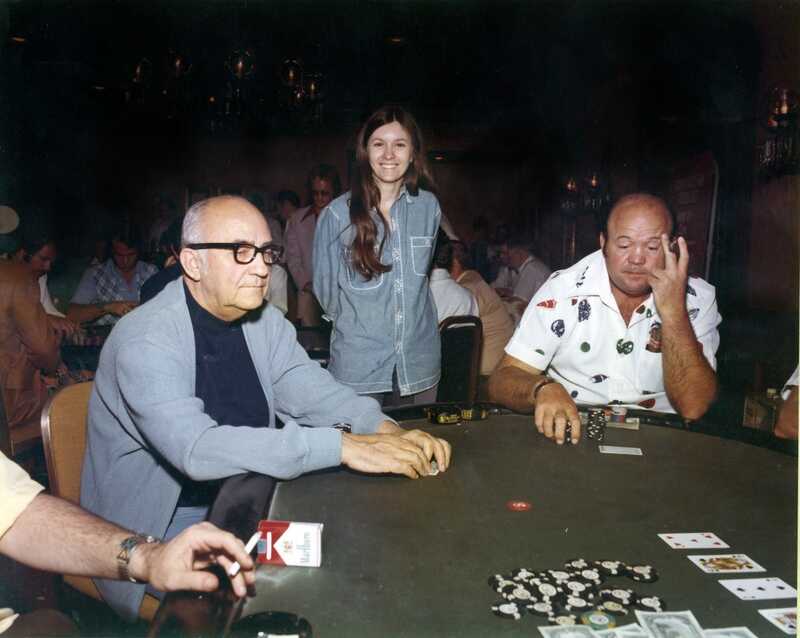 In 1978, Reese won the $1000 Seven Card Stud Split at the World Series of Poker and was awarded not only $19,000, but also a prestigious gold bracelet. Four years later, he would go on to win his second gold bracelet for winning the $5,000 Limit 7 Card Stud event. His family life then became a priority as he settled down and got married to long-term girlfriend, Noralene Boyer. He even set up a sports betting tout service, which allowed him to remain at his multi-million dollar home in Vegas with his children. Family was important to him and he once left a poker table down $700,000 in order to see his son play in a little league game. Chip then won the $50,000 H.O.R.S.E event at the 2006 World Series. He sadly passed away, possibly of pneumonia, in December 2007, at a time when poker was beginning to reach its peak. A tragic fact, as many believe that fans of poker never got to see a true master of the game at play. This renowned poker player was born and grew up in Texas in 1907 and learned to cheat well before he learned how to play poker, at a very young age. Whilst he was learning, Moss picked up the tricks of the trade by overseeing local poker games, which allowed him to develop his skills and gain much of the understanding of the game that made him such a great player. He later used his knowledge of how to cheat to play poker fairly, but incredibly well, which earned him the nickname ‘The Grand Old Man of Poker’ at the age of 67. Moss' life was shrouded with legend, Being one to never oblige a cheater, he open fired on a ceiling where the house was spying on the cards of the players. He wounded the man, as they believed he was bluffing. Moss was the first person to win the World Series of Poker Main Event in 1970, which he helped to found, by vote. He is the only poker player in World Series history to have won it 3 times. His most famous game, however, may well be his 5-month long marathon against Nick the Greek in 1949, at the end of which Nick the Greek uttered the immortal words: ‘Mr. Moss, I have to let you go’. His legacy stands as one of the first draft of players to be inducted into the newly introduced ‘Poker Hall of Fame. When he, unfortunately, passed away in 1995, he had under his belt a total of 9 World Series of Poker titles, 8 WSOP bracelets, and numerous other accomplishments. In plainer terms, he was one of the best poker players to have played in history. Jennifer Harman was born in Reno, Nevada, in 1964, and has since risen to great heights in the world of poker. Her story is that of many twists and turns, including bankruptcy and chronic health problems. Despite battles with her health, including two kidney transplants, she has carved out a dazzling poker career. In fact, when she played Andy Beal, she was just days away from having her second kidney transplant. Despite her constant fear that she was about to have a stroke, Harman still managed to just about break even during that match. She learned to play poker in a five-minute lesson and went on to win a World Series of Poker bracelet in 2000, against seasoned professionals. Harman was the first woman to win two bracelets in WSOP open events, making her a true poker pioneer. Originally just a hobby, she proved herself a promising player, she is now the best all-around woman player in the world and is the only woman to win two WSOP bracelets. Poker was a major part of her life as after graduating from college and she quit her work as a drink mixer in order to play poker full time. She then quit poker to gamble on setting up her own company but would eventually turn back to the profession in order to deal with the debt. Not a complete sob story, however, when considering the success that she would go on to have. Stu Ungar, also known as ‘The Kid’, or ‘The Comeback Kid’, played professional Blackjack and Gin Rummy, as well as poker. Considered to be one of the greatest poker plays of all time and well deserving of his place on this list, it is undisputed that he was hands down the greatest No-Limit Hold’em play in the history of gambling. He was born in September 1953 and grew up on the Lower East Side of Manhattan. Ungar had an incredibly high IQ, and in his childhood was a gin rummy star. By the 60s, he was good enough that he left school to play full-time as a source of income for his family. He only began to play poker in Las Vegas at 24 years old and with little experience, he entered the $10,000 buy-in World Championship event at Binion’s Horseshoe and won. After a downward spiral into debt and addiction, he made a spectacular comeback (hence his nickname), winning the 1997 WSOP main event after borrowing money to play. As a poker player, he lived up to his reputation of being ‘relentless’, and it was guaranteed that if he detected any signs of weakness of bluffs that he would take the pot away. He was also the only man to ever win both the WSOP and Amarillo Slim’s Super Bowl of Poker, setting a record of three titles in both tournaments. Ungar was also an expert card counter, notoriously being banned from playing blackjack on any casino premises. If you’ve seen the film ‘Calamity Jane’ or love stories of the Old West, you’ll be familiar with the name ‘Wild Bill’ Hickok. Considered poker’s first legend, he is remembered as the originator of the well-known ‘Dead Man’s hand’, consisting of Aces and Eights (all black cards). Though he has been a character in many fictional tales, he was once very much a real person. He was born James Butler Hickok in May 1837 and was raised on a farm in Illinois. He then had to move to Nebraska as a lawman, although he was eventually dismissed due to the fact that not only was he a heavy drinker that spent most of his time gambling and did not really take his role seriously, but he also killed a deputy by accident. However, it was not his first crime as a result of gambling, as he supposedly killed a former Confederate soldier. During the American Civil War, he fought for the Union Army. He was also a professional gambler and met his end during a poker game in Deadwood, Dakota Territory when he was shot from behind by a sore loser. His love of gambling not only cost him his life but also his marriage as, in a time when he was desperate for money, he elected to leave his new bride behind in order to find a new career. If this article has given you the urge to place a few bets yourself, check out the variety of online slots and casino games at Slots Baby!